Gretchen Goethner, 77, of Fairfield, co-founded Fairfield Arts for Youth with Sandra Murphy. 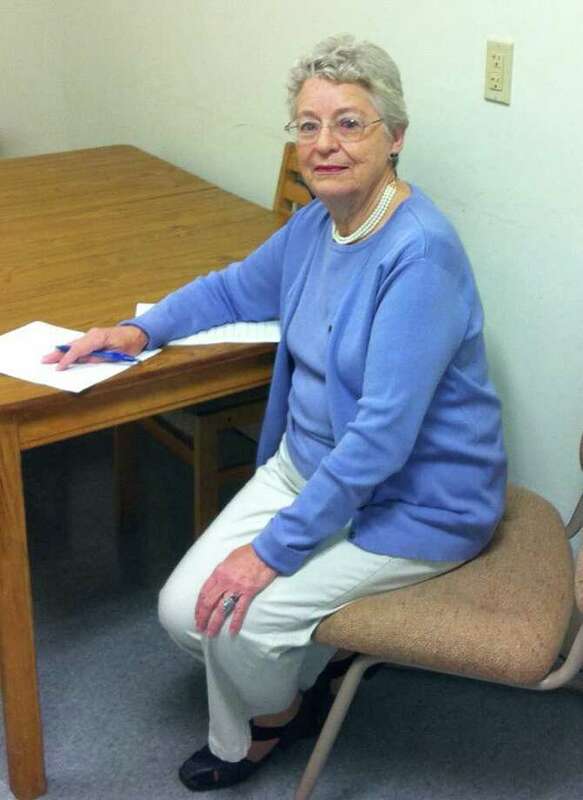 Gretchen Goethner, 77, a librarian and grandmother, works 15 hours weekly at the Fairfield Public Library's circulation desk and in technical support. In 1972, she was co-founder, with Sandra Murphy, of Fairfield Arts for Youth, a program that brings live arts events to Fairfield's public elementary schools. The culturally enriching program, now operateing under the PTA Council baton, has brought many visiting artists to children in kindergarten through sixth grade, including a string quartet from the Hartford Symphony and the Eastern Brass Quintet. During the interview, Goethner said she would like President Obama to stick to core principles of fairness and decency and also suggested that the president lobby for the ordinary working people. A: Divorced after 32 years of marriage and raising three children to adulthood. A: Three children and six grandchildren. ages 2 to 22. A: Work 15 hours weekly at the Fairfield Public Library, on the circulation desk and in technical support. A: I just figured I would get married and have children. Q: What was a significant memory or defining moment in your childhood or young adulthood? A: Moving from sleepy Charleston, W. Va., to Montclair, N.J., 12 miles from New York City. A: When I can afford it, I love to travel. A: I enjoy museums, and recently took in the Metropolitan Museum of Art's new exhibit on Islamic and Middle Eastern art. Q: What music do you listen to and what is your favorite piece? A: Classical is uplifting. I favor Strauss waltzes, and like to dance to them around the house. Q: What TV do you favor? A: PBS specials and Antiques Roadshow. A: Franklin Delano Roosevelt. He came in at a terrible time and under difficult circumstances: The Great Depression and then World War II. History shows FDR knew what to do. A: Stick to core principles of fairness, decency. Lobby for ordinary working people. Work to change the ratio of business power to political power. A: Pessimistic people. Negativity is a waste of time to me. A: Not really. I prefer looking forward to looking back. Good things have happened to me. I have been very fortunate. A: My children and grandchildren, and being co-founder with Sandra Murphy of Fairfield Arts for Youth in 1972. Murphy was organist at Greenfield Hill Congregational Church. Our aim was to bring live performances to Fairfield Public Schools, kindergarten to the sixth grade. The program continues today. Murphy and I bowed out once the project rolled under its own steam. It was, and is, financed by gifts of a penny or five cents per child. General Electric was in from the beginning for a nickel per child beneficiary. A: I feel children need to be exposed to real world experiences, as opposed to those that come through computers. A: Be attentive to when it pays to be flexible. Changes in schedules and openness to ideas can be growth moments. Be open to changes around you. Don't be out-of-date. Be positive. It's much less stressful for you and those around you. You never know when a wonderful opportunity will present itself. Be ready to take advantage of it. A: Watching and reflecting on my children and grandchildren. A: More opportunities to serve the world and its people. Q: If you had a magic wand, what would you wish for? A: Opportunities of growth for everyone.